Honor� de Balzac: I told you it would be a success! Gosselin: But that's what you say everytime. Honoré de Balzac (1799-1850 originally named Honoré Balssa) was one of the founders of literary realism. By the age of 21, the French author had already penned numerous novels under pseudonyms, but had been virtually ignored by critics. His continued writing attempts and failed publishing business left him saddled with great debt, but following the death of his father, he wrote a series of 6 novelettes, between 1830 and 1832, entitled Sc è nes De La Vie Privée. In 1833, he began to imagine the 6 linked together with a whole body of work that would represent all of French society, in a grand work he titled La comédie humaine (The Human Comedy), drawing inspiration from Dante's The Divine Comedy. By the end of his career, this endeavour would encompass over 90 novels and novelettes, and comprise over 2,000 characters, many of whom appeared in multiple volumes. Fueled by potent Parisien coffee, he kept a frantic work schedule, but his love of finery and exotic tastes, coupled with a miserable business sense, kept him under constant siege from his creditors. Only the aristocratic women in his life kept him from disaster with their continuous financial support. 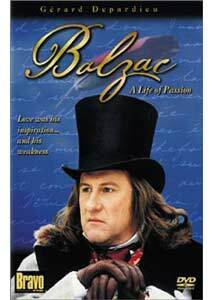 Gérard Depardieu fills the part of Balzac in this French/German/Italian made for television co-production. The film opens with the echoes of his childhood in a boarding school where the seeds of his mother's (coldly played by Jeanne Moreau) disaffectionate relationship with him, and the decision to begin publishing under his own name after a his early works are treated as worthless trash. With his publishing business severely in debt, he relies on the handouts from his wealthy older lover, Madame de Berny (Virna Lisi), to lavish his abode in the works of the masters, despite his owings. His extravagance also extends to the ladies, and he is not bound to monogamy, as mistresses are a vital part of his French society, and as he begins to draw on his own observations of the world around him, its scandalous nature becomes a hit with modern audiences. Ever dodging his creditors, and under incessant criticism from his doubting negative influence of a mother, the story continues to his first encounter with Eveline Hanska (Fanny Ardant), a married Polish noblewoman living with her husband (Gottfried John) in the Ukraine. Presented in two parts, Balzac: A Life of Passion follows the ambitious and excessive lifestyle of the author, shunned and ridiculed by his mother, snubbed by critics, yet adored by his audience. Directed by Josée Dayan (The Count of Monte Cristo) and set in lavish surroundings, the production quality is notable, with elaborate period costuming and grand locations capturing the ambience, through which the camera floats to reveal the spectacle. The acting is superb, with Depardieu bringing the flamboyant Frenchman to life in all his fantastic eccentricity. Fanny Ardant does a wonderful portrayal of Eve Hanska, the source of Balzac's Mme Hulot in La Cousine Bette. The entire supporting cast adds life and depth to the characterizations. Balzac: A Life of Passion captures the inspiration for one of the world's most prolific writers, through an epic and oft times humorous story of his life and loves. Image Transfer Review: Presented in nonanamorphic 1.5:1, the image is for the most part clean and well defined, well suiting the lush and earthy visuals. Some scenes feel a bit over dark, but in general contrast is fine. Colors are well saturated without being overdone. There is some minor edge enhancement, but nothing too distracting. On the whole a nice presentation. Audio Transfer Review: French audio is clear and without noteable distortion. Frequency spectrum is well covered, though sibilance is just a touch over pronounced. The stereo field is justly utilized, however dialogue remains primarily anchored to center. Extras Review: Extras are a little light. Filmographies for Gérard Depardieu, Jeanne Moreau, Fanny Ardant, Virna Lisi, Katja Rienmann, Claude Rich and director Josée Dayan are included. A TV trailer for Balzac and a home video trailer for The Count of Monte Cristo round out the supplements, if you don't count the forced, but skippable opening commercial for Landrover. With only 16 chapter stops to serve the three-and-a-quarter hour feature, this too is a little on the inadequate side. The disc starts automatically, which had me baffled by the abruptness of the end of part one, until I checked the menu and discovered the second half. Standard weblinks and DVD production info is also included. His works, including La Peau de Chagrin, La Grande Breteche, Eugénie Grandet and La Cousine Bette, have inspired dozens of films, and this 1999 television mini-series takes a fascinating and well constructed look at the 19th century French literary genius, Honoré de Balzac. Gérard Depardieu presents this quirky and prolific character with flair, surrounded by great period atmosphere and an all-star cast, in an interesting account of his life. Recommended for those with historical and literary tastes.